here we are again. I feel like we're at home; even the wind, gusting at 85 kilometres per hour, feels familiar and comforting. the marvel of a good night's sleep. Claudia joins us. centolla and pisco sours by Sotito; airport. tonight, Rapel. bahia azul in the early evening. i'm thrilled to approach the strait from the tierra del fuego side and can barely wait to get on the ferry. the water is aquamarine blue and covered end to end in whitecaps swelling up to seven feet. the ferries are nowhere to be seen, and buses, sheep-carrying trucks, cars and people line the road leading to the beach. shell-seeking, we climb over massive piles of kelp, walking back to revisit our landing. terns fish at the water's edge. the currents are clearly delineated by spots of rough chop, places of calm, and color differentiations in the water. a few of our tonhina friends swim by. back at the restaurant, an elderly, indigenous-looking woman sits alone in a chair pulled up against the window, hands folded calmly in her lap, gazing at the wind-tossed water. finally, after a couple of hours' wait, the red ferry lopes across the Strait from Punta Delgada, tossing and swaying, sprayed with massive waves. it's terrifying and takes way too long. despite being loaded with ten buses, many cars and several hundred people, the boat teeters and rolls in the powerful chop. El Estrecho de Magallanes is a body of water to be reckoned with. I'm impressed by the distance that we swam last year-- probably more than four miles-- and also filled with immense respect for the Strait, having been let across. tierra del fuego got its name from the heavy mists that cover the island, making it look confused and ablaze. i think tierra del humo might have been more apt. this route is endless and crosses back and forth from Argentina to Chile. how we all wish we could have flown, or gotten on the boat. 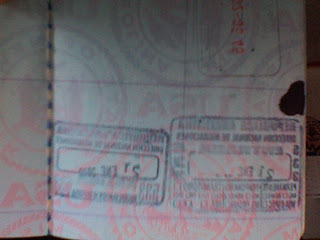 my passport is riddled with stamps; I can only laugh at the absurdity of all this exchanging of information. perhaps we might exchange hats instead. or pleasantries. we've gone from a place so far at the end of the earth that it can only be peaceful and protected, to the commercial 'end of the earth', to the wild expanse of Tierra del Fuego, where the wind blows over 100 miles per hour. standing in the midst of it, wholly aware of spinning through space, I feel like this place, of all the southern wilderness, is the one that actually merits the name. goodbyes on the old Macalvi-- the Club de Yates, where our immigration-inspector friend joins us for a last goodbye and some more stamps in our passports. it seems, at this point, as if we know everyone in the town, both in uniform and office, and in street clothes with families. all are there to see us off, even fluffy Luli, who gets into trouble with another small dog running around the deck of the Macalvi. Gaby shuts her in the van. a few minutes later, there is a persistent honking, then a long, desperate beeeeeeeeep! and we all look up to see Luli at the wheel of the white van, leaning on the wheel. a speedy ride in a covered zodiac, extremely choppy at first, like a mechanical bull-ride, then calmer, and progressively colder as we head west. after more than an hour, we dock incongruously next to a massive cruise ship in the port of ushuaia. I gape at the activity: shipping crates, planes, catamarans, ships of all nationalities and sizes. the clear kelpy water is glazed with oil and scum. exhaust fumes sting in my nostrils. refugees from the wilderness, having left the anachronism of the tiny, peaceful comun naval, we've landed up in what seems to be one of the busiest ports of international tourism. there are a striking number of people over sixty. it seems that traveling to the extreme southern hemisphere is even more of a craze than i'd envisioned. the streets teem with people, cars, flatbed trucks, antarctic tourist offices, pictures of penguins and seals, glossy shopping bags. I see a single black dog traipse across the square with a giant piece of bloody red meat swinging from its jaw. the distance across to Puerto Navarino is massive. Lynne Cox is a superheroine. I feel our little there-and-back shrink in comparison with her six-mile, three-hour channel charge. leaving this little town in a few minutes for ushuaia. yesterday as we spoke at the threshold with a fellow hostel-guest-- in town to install a meteorological antenna-- huge horses wandered through the adjoining yards, irreverently eating tall grass over fences. the small labrador puppy cavorts, looking for our attention. it approaches a cat playfully and is sent off with a harsh hiss. Lulita runs out to join the other puppies in this local gang, some of whom playfully jump up on the old sheepdog. looking around, dogscatshorseschickens, I'm once again floored by the intimacy and simplicity of this tiny settlement. animals and people-- many of the former abandoned by the latter-- are a tight community here. there's not much to worry about, at least in the summertime. yards are piled with quartered logs, many hairy with wintergreen lichen. in the living room of our hosts, large photographs of lichen and fungus adorn the walls. press calling again. El Pinguino and La Prensa Austral. we're huge in Patagonia. tomorrow, El Mercurio. our plans to ride the ferry to punta arenas thwarted, we've just fixed up an alternate situation, which includes a boat to and an evening in Ushuaia. comings and goings are not easy here in Puerto Williams. high winds will prevent air traffic for the next couple of days. I'm looking forward to seeing more of Argentina than just a wild beach, although what a beach it was! throughout today, flashes of yesterday's swim keep going through my mind: a panorama of snowcapped mountains, wild birds above a choppy green foreground, breathing to my left en route to argentina; strange blue-brown jellyfish-like sea creatures in the emerald clear below me mid-channel on the return leg; the rocky shallows teeming with sealife on the approach to each beach; the flaming-june orange of the argentinian's oversized drysuits; olive kelp bathed in filtered sunlight. the sound of wind against my ears. the whole swim, windswept and sunblinded, was beautifully disorienting. without perspective to judge the distance of land, and without human landmarks, I seldom knew where I was. I sighted until my neck hurt, just to be there. it was only near the end of the swim, when I was cold and tired and my mind had checked out, that Captain Elvis and Jose another armada sailor appeared, tiny beneath the wooly cliffs. i've never been so relieved to see a sailor. as I started to realise how far we still had to swim, and as minor hypothermia began to cloud my awareness, I screamed a couple of times underwater, just to release the frustration of momentarily losing my humanity. it made me feel better, almost as much as the double-thumbs-up the armada men kept throwing my way, under encouraging grins. our stopover in Argentina at Punta McKinley, where Cristian and I concurred that we felt warm, great-- dude, we're in Argentina!-- was a little too long. getting back in the water was a bit of a shock for all of us. I have a new appreciation for those who swim Channel doubles and triples. the drastic difference between the water temperature and the air causes the body to almost immediately shift gears and start re-warming. the second leg of this swim was mentally and physically tough. luckily, we were all determined, and well-trained after a number of weeks swimming the the 30s back in arctic Brooklyn. but today, the swimmers walk. we hike serro bandera to the top, where a massive Chilean bandera snaps in the wind just above the treeline. the wind fills my mouth and ears, as if I'm on a motorcycle at high speed. at the top, six hundred meters above sea level, staving off a cold wind blowing off nearby glaciers, I nearly lose my down jacket. we traipse through deciduous, strange forests, lichen-softened scree teeming with shale and sandstone chips, and bent-trunk tree groves, patti with a walking-stick taller than herself and me bounding like a mountain goat, trying not to slip in my very inappropriate shoes, practically skipping at times from happiness at being in the forest. Cristian's pace walking is exactly like his long-distance swimming pace-- steady, calm. 21.1.10 once again, cibbows rocks the southern wilderness. and wearing kathleen cook to boot. thanks again to Kathleen for sponsoring me with a fabulous bikini, even if I have been fattened up by our lovely hostess Gabriela and the pan amasado. this morning, at 11.20, Patti, Cristian and I walked into the rocks and kelp along the shore in Cabo de Hornos and swam to shore near Punta McKinley, Argentina. we spent a few minutes on the beach with the Argentine armada before jumping in and returning to Chile. All three of us succeeded in a double traverse of the Beagle Channel. we started out in rough seas at 5 degrees celsius (41 degrees fahrenheit). after being pushed west on the way to argentina and encountering strange sealife and a flock of penguins, we fought strong currents on our return, making it a roughly 3.5-mile swim. all of us had a quick, easy recovery at the armada capitania. more impressions to follow. but where are the beagles?! they're great at paperwork, but can they swim?